Valerie James (middle) with her two younger sisters Diana and Kirsten at a jewelry gallery. With an instinct for the arts, North Penn Graduate of 2012 Valerie James has put her creative ends together to form stunning jewelry. J Pod and the art department was home to James as she made her way through high school. Not only was James taking AP art classes, painting, and drawing, she was Editor and Chief of the Accolade. Leadership seemed to be a pattern for James and she went on to become President of the Creative Artists Club and North Penn Arts Honor Society. “North Penn High School provided a challenging and rewarding platform for me to develop the skill and patience necessary for applying to art school,” reflects James. Temple University was the next stop after graduating from North Penn. The Tyler School of Art become her new J Pod where she was able to find a new form of art and would eventually graduate with it. James graduated from Temple in 2016 with a major in Metals/Jewelry/CAD-CAM. 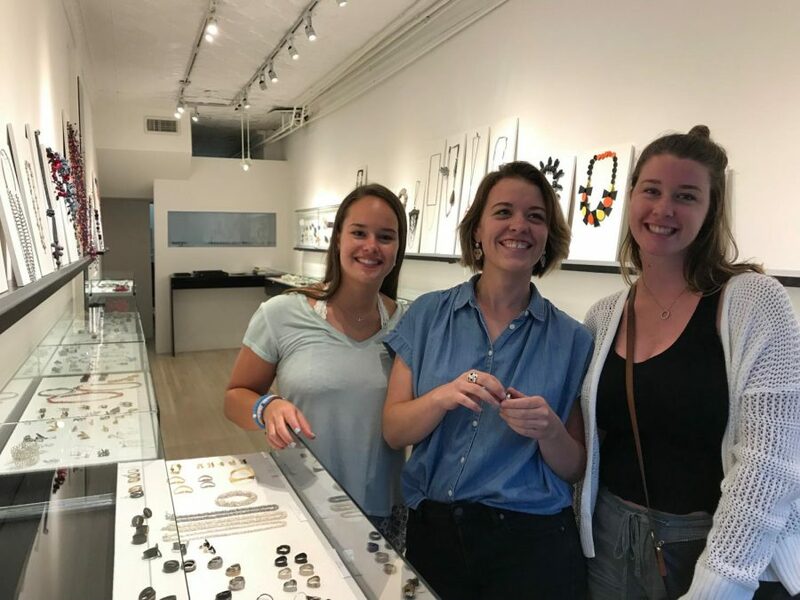 After working full time as a designer at International Manufacturing Company on historic Jeweler’s row in Philly for a year, she decided to head back to school. With a passion to develop her conceptual artwork further and gain teaching experience, James went to Rhode Island School of Design for their graduate program. With a focus in Jewelry and Metalsmithing, James plans to graduate in June. “I have been fortunate enough to receive some awards that helped fund my grad school education such as the Tiffany and Co. scholarship and the Women’s Jewelry Association Peggy Kirby award. I have been teaching a variety of jewelry courses at RISD in addition to my own required courses,” explained James. Jame’s Graduate Thesis Exhibition is in May and will be presented in the Rhode Island Convention Center. Her work has also been selected for two upcoming exhibitions and will travel the art world. James wants to continue teaching at a College or University in the near future. What do you miss most about North Penn?